Beatrice Riviere is a Noah Harding Chair and Professor in the Department of Computational and Applied Mathematics at Rice University. She received her Ph.D. in 2000 from the University of Texas at Austin. Her other degrees include a Master in Mathematics in 1996 from Pennsylvania State University and an Engineering Diploma in 1995 from Ecole Centrale, France. She is the author of more than ninety scientific publications in numerical analysis and scientific computation. Her book on the theory and implementation of discontinuous Galerkin methods is highly cited. Her research group is funded by the National Science Foundation, the oil and gas industry and the Gulf Coast Consortia for the Quantitative Biomedical Sciences. Dr. Riviere has worked extensively of the development and analysis of numerical methods applied to problems in porous media and in fluid mechanics. Dr. Riviere is an associate editor for the SIAM Journal on Numerical Analysis and a member of the editorial board for Advances in Water Resources. She has graduated a total of twelve Ph.D. students, with seven working in academia and five in industry. Songul Kaya, Ph.D. 2004. Associate Professor at METU, Turkey. Yekaterina Epshteyn, Ph.D. 2007. Associate Professor at the University of Utah. Qi Mi, Ph.D. 2007. Assistant Professor at the University of Pittsburgh, School of Health and Rehabilitation Sciences. Prince Chidyagwai, Ph.D. 2010. Assistant Professor at Loyola University. Aycil Cesmelioglu, Ph.D. 2010. Associate Professor at Oakland University. Sevtap Ozisik, Ph.D. 2012. Employed by Direct Energy. Kun Liu, Ph.D. 2013. Employed by Panton. Xin Yang, Ph.D. 2014. Employed by Google. Yingpei Wang, Ph.D. 2014. Employed by Google. Jizhou Li, Ph.D. 2015. Employed by ExxonMobil. Charles Puelz, Ph.D. 2017. Postdoc at University of North Carolina. Emily Hendryx, Ph.D. 2018. Assistant professor at University of Central Oklahoma. 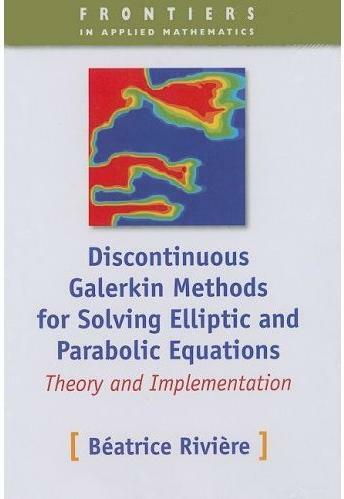 Discontinuous Galerkin Methods for Solving Elliptic and Parabolic Equations: Theory and Implementation. Available at SIAM. Download errata here.